Vienna, the capital of Austria (coordinates: 48° 12′ 30″ N, 16° 22′ 23″ E) situated on the Danube at the crossroads from East to West and North to South. 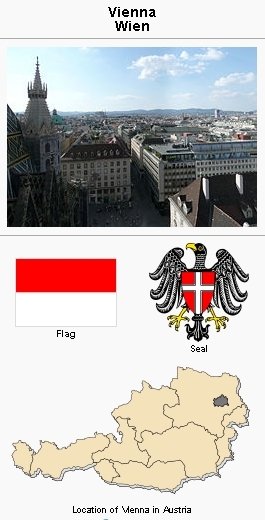 Vienna had been the seat of the ruling house of Hapsburg since ca. 1300 and a strong bulwark against the Turks in 1529 and again in 1683. It is a place where many nations and races mingle but has a predominantly German population (2008 population, 1,681,469). Vienna never had an Anabaptist congrega­tion for any length of time but was the scene of execution of at least 23 Anabaptists during the reign of Ferdinand I. Among the martyrs were Balthasar Hubmaier and his wife, executed 10 March 1528; Jacob Wideman; Hieronymus Käls, the schoolmaster, martyred with Michel Seifensieder and Hans Oberecker on 31 March 1536; Oswald Glait in the autumn of 1546; Hans Staudacher and Anthoni Keim, executed with two others on 22 November 1546; and finally Hans Gurtzham of Carinthia on 27 June 1550. The first Anabaptist influence in Vienna was ap­parently brought by transient brothers on their way to and from Nikolsburg (situated 50 miles north of Vienna), where Anabaptism had shown a vigorous growth ever since Hubmaier and Glait led the movement (ca. 1526). Hans Hut, leaving Ni­kolsburg with Glait in early 1527, stopped in Vienna and held meetings (well known in Anabaptist his­tory) at a house in the Kärntnerstrasse, where he is said to have baptized not fewer than fifty persons, among them Leonhard Schiemer. Discovery of the group by the authorities forced Hut to flee and seems to have led to the final dissolution of this budding congregation. A well-advertised threat of the harshly Catholic Ferdinand to tear down houses which harbored Anabaptists was not carried out, and it is known that the inn "Freisinger Hof" actu­ally had Anabaptist guests after this. Apparently some of the Austerlitz Brethren, led by Jacob Wideman , maintained a group in Vienna for a time, but little is known about them. However, Inquisition material shows that booksellers in Vienna were always in contact with Moravia and may have functioned as middle­men (DeWind). Hieronymus Käls, who was arrest­ed with Michel Seifensieder and Hans Oberecker in Vienna on 8 January 1536, while en route to his breth­ren in Tyrol, reported in his second letter from prison, "We have learned that many pious Christian hearts have nobly testified the truth of the Lord here in Vienna, brothers and sisters." Among these was Jacob Wideman, whom Käls mentioned ex­pressly as a martyr (1535). Leonhard Lochmaier, likewise en route to Tyrol from Moravia, was arrested with Jörg Fasser in Neudorf, south of Vienna, and brought to trial in Mödling nearby, but they were soon miraculously freed. Oswald Glait was also arrested in Vienna in the fall of 1546, and having resisted all pressure to recant was drowned in the Danube at night. The last Ana­baptist execution in Vienna was that of Hans Gurtzham in 1550. A milder policy toward nonconformists came with the accession of Emperor Maximilian II in 1564, but this period soon came to an end when Jesuits settled in Vienna and with them the Counter Reformation set in. There is no further record of Anabaptists in Vienna, even not as transients. After World War II numerous Mennonite refu­gees from Russia found their way to Austria through Rumania, Hungary, and Czechoslovakia, some of them (ca. 400 at the peak) settling in Vienna, where a few were still living in 1958. The Mennonite Central Committee began relief work in Austria in September 1946, with headquarters in Vienna, min­istering to the general population as well as to Men­nonite refugees. In 1949 a headquarters house was secured and a spiritual ministry established which ultimately developed into a mission. The mission was fully organized with a pastor in 1957 under the Swiss Mennonite Conference with MCC financial support, and located in the MCC house at Cottagegasse 16, purchased in 1958. In 1959 the mission was transferred to the European Mennonite Evangeliza­tion Committee (EMEK). De Wind, Henry. "A 16th Century Description of Religious Sects in Austerlitz." Mennonite Quarterly Review XXIX (1955): 45. Hege, Christian and Christian Neff. Mennonitisches Lexikon, 4 vols. Frankfurt & Weierhof: Hege; Karlsruhe: Schneider, 1913-1967: v. IV, 535-536. Unruh, J. D. In the Name of Christ. Scottdale, PA: Herald Press, 1952. Loserth, Johann and Robert Friedmann. "Vienna (Austria)." Global Anabaptist Mennonite Encyclopedia Online. 1959. Web. 20 Apr 2019. http://gameo.org/index.php?title=Vienna_(Austria)&oldid=146309. Loserth, Johann and Robert Friedmann. (1959). Vienna (Austria). Global Anabaptist Mennonite Encyclopedia Online. Retrieved 20 April 2019, from http://gameo.org/index.php?title=Vienna_(Austria)&oldid=146309. Adapted by permission of Herald Press, Harrisonburg, Virginia, from Mennonite Encyclopedia, Vol. 4, pp. 819-820. All rights reserved.